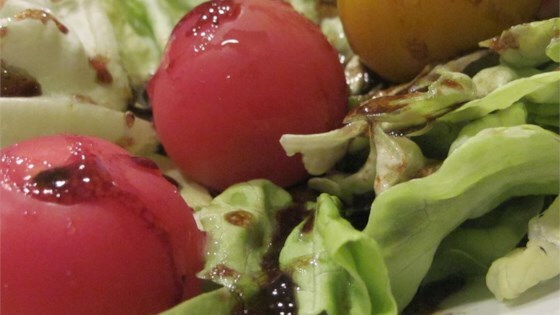 "This sweet and tangy Balsamic dressing is perfect for spring mix!" Whisk olive oil, balsamic vinegar, sesame oil, raspberry preserves, salt, onion powder, black pepper, cayenne pepper, and dry mustard in a bowl until thick and smooth. Cover bowl with plastic wrap; refrigerate at least 1 hour. Tasty dressing. Super easy to make. I would cut back on the sesame oil just a bit next time. The flavor was a little strong. great concept. thinking there was a typo in the recipe. 1/2 tsp or tsp of Sesame oil....careful. Too late to change now, so I added 2 more TBSP of Raspberry jam. It did have a nice zip for tang. yum, my husband even liked his salad! Reduced sesame oil to 1/2 tsp. Substituted preserves for 3 tablespoons frozen raspberries plus one envelope stevia sweetener for a sugar free dressing. Delicious!